Currently, many countries still lack access to geospatial data due to limitations in data availability and technical capacity. 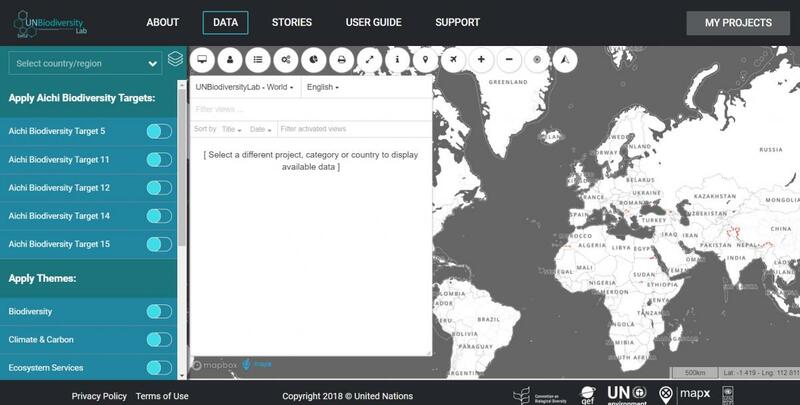 The free, online, open-source UN Biodiversity Lab platform provides spatial data through a free, cloud-based tool to support Parties to the UN Convention on Biological Diversity (CBD) in reporting on their achievements and to inform their conservation decision making. The UN Biodiversity Lab platform was launched in 2018 by the United Nations Development Program (UNDP), the United Nations Environment (UN Environment), and the Secretariat of the Convention on Biological Diversity (CBD) Secretariat. 1.) To allow policymakers and other partners to access global data layers for national action, upload and manipulate their own datasets, and query multiple datasets to provide key information on the Aichi Biodiversity Targets and nature-based Sustainable Development Goals. 2.) To improve accountability and enable better decisions through spatial literacy. 3.) To revolutionize biodiversity planning through transparent spatial data reporting and analyses. offers a customizable toolkit for analysis, visualization, and sharing. By creating a collaborative, open-source environment, the UN Biodiversity Lab is an inclusive and scalable data platform. Flanders Marine Institute and other premier research institutions. All data providers recognize the need for innovative tools to monitor trends through utilizing spatial data, better understand the causes of global biodiversity loss, and to provide data that can help assess the socio-economic implications of different pathways. ... for sustainable development is highlighted by the Nature for Development Declaration on Spatial Data, which was opened for public endorsement at the launch event. To date, 20 institutions have endorsed the Declaration. A large number of countries, UN Agencies, NGOs, academic institutions, and indigenous peoples organizations are expected to endorse. Over time, the UN Biodiversity Lab will offer access to big data on sustainable development, and incorporate automated monitoring using artificial intelligence (AI) to support planning for human and planetary health. The Group on Earth Observations (GEO) is an intergovernmental partnership that improves the availability, access and use of Earth observations for a sustainable planet. GEO promotes open, coordinated and sustained data sharing and infrastructure for better research, policy making, decisions and action across many disciplines. The GEO community focuses on three global priority engagement areas: (1) the United Nations 2030 Agenda for Sustainable Development, (2) the Paris Agreement, and (3) the Sendai Framework for Disaster Risk Reduction. You are welcome to Sign up for AIMS News, follow @AIMS_Community on Twitter... And, thanks again for your interest!